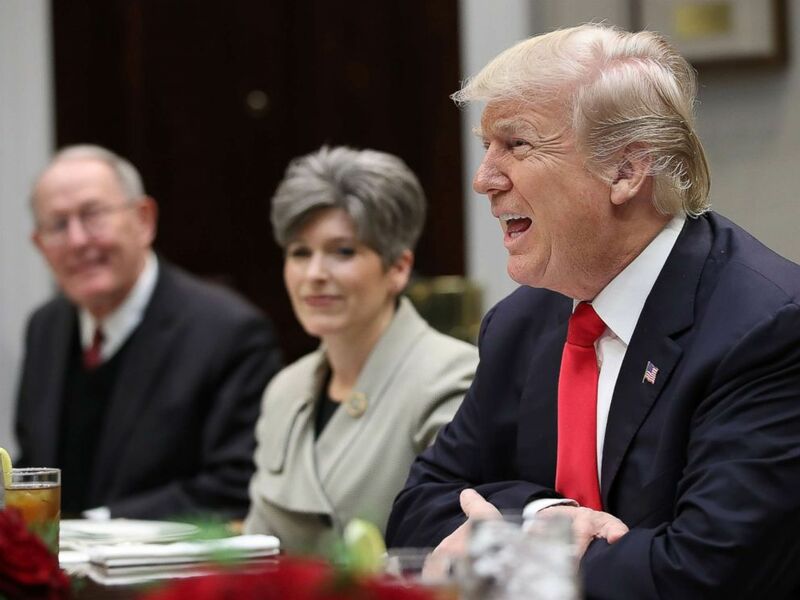 President Donald Trump on Wednesday hailed congressional Republicans' ambitious $1.5 trillion rewrite of the tax code as a win for middle-class Americans. Add Taxes as an interest to stay up to date on the latest Taxes news, video, and analysis from ABC News. He took a victory lap alongside Republican lawmakers at the White House after the GOP's passage of the massive overhaul set to reshape the nation's tax code. The White House said he hopes to sign the bill in the coming days after it is officially enrolled. In the House after the first vote on Tuesday, Speaker Paul Ryan, who long sought the overhaul, was triumphant announcing the results, bringing the gavel down emphatically and then letting it drop off the podium. Afterward, Ryan said that on "New Year's Day, America will have a new tax code for a new era of American prosperity." "When House Republicans began this journey, we had two goals in mind. We believed Americans deserved a tax code bill of growth. We believed America could leapfrog back to the lead of the pack as a best place on the planet for the next new jobs and next new business. Today we achieved those goals," he said. Pence presided over the vote in the Senate. He announced that the bill passed, eliciting a standing ovation from the GOP side of the room. "After eight straight years of slow growth and underperformance, America is ready to take off," Senate Majority Leader Mitch McConnell said during a late-night press conference at the Capitol. Even though the bill is just steps from becoming law, McConnell said he knows there is still work to do. "My view of this, if we can't sell this to American people, we ought to go to another line of work," he said. Senate Minority Leader Chuck Schumer said Republicans will "rue the day" they passed the tax overhaul. "Given the bill's substance, it's no surprise they're in such a rush. Eleventh-hour backroom deals have managed to only make their bill even worse. They don't want people — folks, they don't want to discuss it, they don't want to have it, have some light shed on it. They don't want anyone to know what's in it because it is so, so bad. And the public knows it," he said. With the GOP unable to send the American Health Care Act to the White House, the passage of the tax overhaul finally furnishes a decisive legislative victory for Trump, fulfilling one of his chief campaign promises just before Christmas. In the House, 12 Republicans voted no — as did all Democrats. Almost all those Republicans represent high-tax districts where new limits on the state and local tax deduction are not popular. Republicans who voted against the bill were Reps. Darrell Issa and Dana Rohrabacher of California; Rodney Frelinghuysen, Leonard Lance, Frank LoBiondo and Christopher Smith of New Jersey; Dan Donovan, John Faso, Peter King, Elise Stefanik and Lee Zeldin of New York; and Walter Jones of North Carolina. King said earlier that Republican voters in his district won't count the bill as a win. "People who voted for Trump are very disappointed," he told reporters Monday evening. "It's certainly unpopular in my district. That's all I'm hearing from Republicans." The legislation maintains seven tax brackets, with the country's top earners enjoying a tax decrease, from 39.6 percent to 37.0 percent. It dramatically cuts the corporate rate, from 35 percent to 21 percent. Republicans crafted the bill with the aim to simplify the tax code by cutting loopholes for special interests. But the new rules preserve many popular deductions, such as for mortgage interest, student loans, adoptions and charitable giving. President Donald Trump speaks during a meeting with Republican members of Congress about tax reform and trade policies on Dec. 5, 2017 in Washington. The measure repeals Obamacare's individual mandate, which requires people to buy health insurance or pay a penalty. That could lead to 13 million more Americans without health insurance, according to the Congressional Budget Office, though it would save $338 billion in federal health insurance subsidy payments over the next decade. The bill, which carries an estimated $1.5 trillion price tag over 10 years, was not expected to win any Democratic support. House Minority Leader Nancy Pelosi pointed to a new analysis from the nonpartisan Tax Policy Center that predicts 86 million people would see a tax increase compared with current law by 2027, while 83 percent of the anticipated benefits would be reaped by the wealthiest 1 percent of taxpayers. "Republicans will vote to let the wealthiest 1 percent steal the future of the middle class in America," Pelosi, D-Calif., said before the vote. "The GOP tax bill will go down as one of the most scandalous, obscene acts of plutocracy ever." Rep. Kevin Brady, the chairman of the House Ways and Means Committee, said that analyses focusing on the back end of the 10-year window are misleading because many of the individual tax breaks expire in eight years. "That's just cherry-picking the numbers," he said. "Look, we've just finished eight years of Washington spending your money. Let's try eight years of you spending your money and making America competitive, and then a future Congress can decide is that right for this country. My guess is they're going to say people should keep more of what they earn." Trump tweeted before the vote Tuesday that the bill would be the "biggest tax cuts and reform EVER passed" and is "totally understood and appreciated in scope and size." PolitiFact rated his previous similar claims about the "biggest tax cuts" as "false."